Get a taste of van life with a Japanese campervan adventure. The majority of visitors to Japan will rely on the country’s well-established transportation infrastructure consisting of mostly trains, domestic flights, and highway buses. But truly creating your own adventure requires your own transportation. All the better if you can combine sleeping quarters with a vehicle. Campervans are increasingly popular among tourists to Japan seeking to explore rural areas and develop a deeper connection with the country and its people. For many, the appeal of going to bed and waking up with castles out the window, having barbecues on the beach, and driving to and from all the major sites on your must-see list is too enticing to pass up. If you are traveling in Japan with your significant other, a few friends, or your family, having your own vehicle is definitely the best way to tailor-make your unique holiday experience. For our trip, we rented a Conversion Van from Camper x Camper in Osaka and spent a long weekend exploring parts of Hyogo Prefecture as well as the Chugoku Region (Hiroshima, Okayama, Shimane, Tottori, and Yamaguchi prefectures). The Van was a Toyota Voxy equipped with extra mattresses and camping equipment. With the back seats folded down, it provided a comfortable sleeping area and a great all-around camping experience. The main expenses associated with this type of travel are the price of the rental vehicle, gas or petrol for the vehicle, and highway toll charges. However, you can significantly reduce the price of tolls by traveling on public highways and roads, which are toll-free. We decided to do much of our driving along the coastline, following the coast in Tottori, Shimane, and Yamaguchi, so not only did we largely avoid tolls, but we were able to make various picturesque beachside stops along the way. Our first stop was Himeji in Hyogo Prefecture. After scoping out the picturesque Himeji Castle, we headed to Kagura no yu, a public hot spring attached to a hotel in the city center where we had a nice long hot soak. Onsen (hot springs) and sento (public baths) are ubiquitous all over Japan, which is incredibly handy when traveling in a campervan, which is obviously not equipped with shower facilities (On this trip we also visited Hikawa Bijin Onsen in Shimane Prefecture and Otani Sanso in Yamaguchi Prefecture). 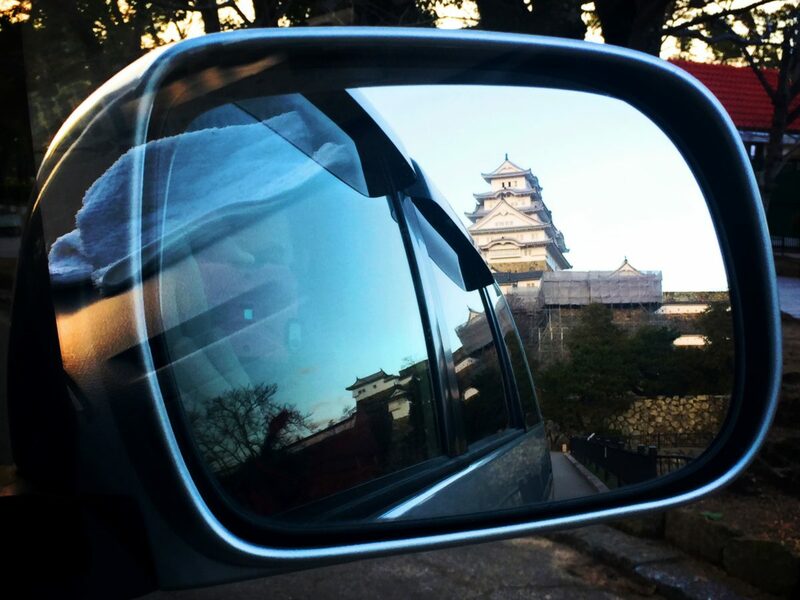 After bathing, we found a parking spot adjacent to the lit up Himeji Castle and drifted off to sleep with a beautiful view out the back window. On Saturday morning, after leaving Himeji, we drove toward the opposite coast in the direction of Tottori. We arrived in the Hiruzen Highlands, which border Okayama Prefecture and Tottori Prefecture, and parked the van at the trailhead of Shimo-Hiruzen. As we climbed toward the top, we could still see a light snow cover higher on the mountain, but the initial climbing was light and easy. After reaching the summit, having lunch, and descending, we hopped back in the van and continued driving towards the coast. For this trip, I brought my personal tripod camping grill (not included with the rental van) along with some meat and vegetables so we could enjoy sunsets barbecues and spend nights parked on the coast. Sunday morning, we woke up and drove into Izumo City and spent and an hour or so looking around Izumo Grand Shrine and visiting the city’s old train station. The rest of the day was mostly spent driving along the oceanfront through Shimane and much of Yamaguchi before arriving at Motonosumi Inari Shrine. This shrine outside of Nagato City is one of the most spectacular in the country and features a trail of bright red torii gates along the coast. After meandering through the torii gates, you arrive at a rugged open area high above where the waves crash against the rocks. It is absolutely stunning, and a clear highlight of the Chugoku region. Yamaguchi prefecture is also known for delicious seafood and the coveted fugu (poisonous blowfish) is a delicacy. The thinly sliced fugu sashimi is available at supermarkets, and fish markets throughout the prefecture and our Sunday night barbecue menu featured fugu Sashimi and Yamaguchi strawberries as well as sazae shellfish (turbo snails) and sweet potatoes, all purchased at a local seafood market. Another Yamaguchi prefecture attraction is the Akiyoshido Caves in the middle of the prefecture and we spent much of Monday morning touring through these cavernous rock shelters. The cave lighting and audio guide in various languages makes the experience visitor friendly and easy for anyone of any age. The general entrance fee is (¥1,200) and there is an optional (¥300) “caving experience” where visitors can climb ladders and explore more of these various rock formations with a provided flashlight. After emerging from the caves, it was time to turn our attention to lunch. Another popular dish in Yamaguchi, is a type of yaki-soba (stirfry noodles) dish cooked on a sizzling traditional Japanese roof tile. So we set the GPS for the top-rated Choshuya Yuda restaurant in Yamaguchi City near Yuda-Onsen for a scrumptious meal and one last hot spring dip. Monday afternoon and evening was spent making the long journey back to Osaka. Given time constraints and ease of travel, we opted to take the toll road expressway back, with a planned stop in Okayama. From Yamaguchi to Osaka, the tolls were approximately ¥11,000. To rent a vehicle in Japan, you must be legally allowed to drive in the country, which means having a Japanese driver’s license or an international driving permit. If you want to travel outside the major urban areas, be in full control of your movements and travel schedule, enjoy a sense of adventure, and go to places that are otherwise difficult to get to, there is no better transport option than a van. Our Camper x Camper van was fitted with a bed, bedding (including pillows), privacy curtains, a cooler box, a camping table and two camping chairs, camping lights, a box of plates and cutlery, and bug nets to go over open doors and windows. The Camper x Camper website allows renters to select other options to customize their trip. Communication with staff while booking the van was easy and friendly and could be done in English, which was very convenient.